Saturday I always try and put a couple of hours aside for "Ryley and Mum" time. Usually we just go shopping for stuff, or just browsing the shops, and this Saturday was no different. Except first we went and played at the park! Ryley is so good at climbing up the steps and then going down the slide! He literally tries to run from one side of the park to the other! Honestly never thought we would see that day! On Sunday we all took a family drive to Ararat and had a picnic at the park, fed the seagulls and ducks, and then both the boys had a big run around the park and on the play equipment! We headed back out to Amphi on the way home and dropped in to see Nanna and Poppa again. 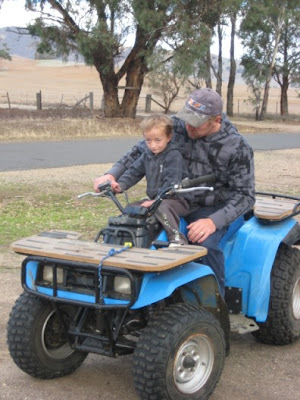 David got the four wheeler out and Ryley and Braeden had an absolute ball "hooning" around. Even I braved it and hopped on the back, but I wouldn't let David go out of first gear!! 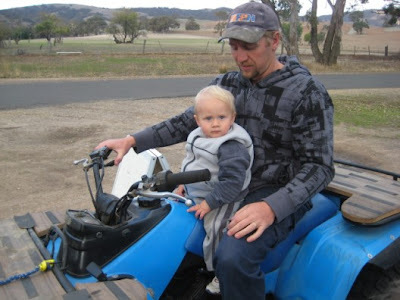 (There is a long story to why I am so scared of motorbikes...some people know it already, but let's just say it involved a broken collarbone!). While we were out at Amphi we took the boys up to play in the old diggers holes. They both had a great time climbing in and out of the holes (and falling back into them!!). I definately have two kids who love the outdoors! WOW anna sounds like you all had a great weekend.The boys would of loved going on the bike.You guys will have to come out and put them on Zoe and Jacks.Oh and Toby.whoops.